Invacare's G-Series beds deliver new and innovative features that further meet patients' needs. The G-Series bed complies with the international standard for hospital bed safety and essential performance, IEC 60601-2-52. With the G-Series bed, you will have the peace of mind that your bed frame, mattress and rails have passed stringent tests to ensure the highest standard for patient safety in the homecare and long-term care environments. Newly Designed Hand Pendant - The pendant is ergonomically designed with an extended heavy duty strain relief for increased flexibility. Connects on either side of the bed for patient's ease of use. Supportive Sleep Surface - The slat deck provides a comfortable sleep surface for patients, reduces wear and tear on the mattress and is simple to clean, allowing for improved infection control. Interchangeable Bed Ends - Extra extensive travel range. Easy to clean and impact resistant. 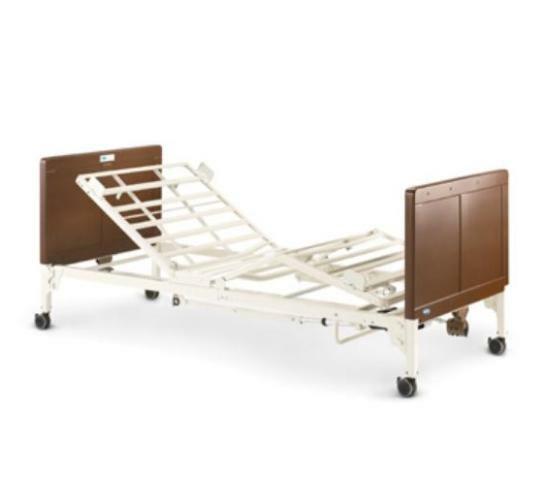 Ergonomic Bed Sections - Ergonomically designed head and foot sections with elongated head section for increased patient comfort. Crank Through Electronics - Allows all motors to be operated manually in the event of a power outage. IP66 Rating - Water resistant connections to prevent fluid ingress. Crank Through electronics - Allows all motors to be operated manually in the event of a power outage. Bed Deck Travel Range: 15 - 32"